Sony Pictures Entertainment has been targeted by computer hackers in an attack which reports say forced it shut down its systems on Monday. A skull appeared on computer screens along with a message threatening to release data "secrets" if undisclosed demands were not met, reports said. The message showed "#GOP" indicating a group called Guardians of Peace was behind the attack. 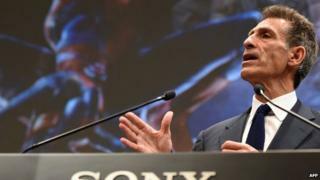 Sony has issued a statement saying the firm is investigating the "IT matter". The tech firm has reportedly shut down its computer network as a precaution and advised employees that resolving the situation could take anywhere from one day to three weeks. Meanwhile, an anonymous user on the Reddit news website posted an image allegedly from a Sony computer screen, which said "Warning: We've already warned you, and this is just the beginning… We have obtained all your internal data including secrets and top secrets". News of the online attack comes just months after Sony's Playstation network was forced offline by a cyber attack in August. Wee Teck Loo, head of consumer electronics research at Euromonitor said any negative news for Sony just "piles" pressure on the company that has been struggling financially in both its TV and mobile business. "Three years ago, the hack on PlayStation network was massive, expensive and absolutely embarrassing. This time round, I don't believe that there will be massive damage, save for Sony's ego, even if the hack is real," Mr Loo said. Charles Lim, senior industry analyst at ICT, Frost & Sullivan Asia Pacific, however, said the attack has put into question what "multi-layers of prevention" Sony has to detect and handle such risks. "In this breach, GOP claimed to have accessed private keys, source codes, password files and even their production schedule and notes, and that will raise questions," Mr Lim said. High profile companies like Sony can be targeted and hacked every day, according to Naveen Menon, partner at consulting firm AT Kearney. In its latest research, the firm said that experts estimate that at least 25% of all companies have already suffered financial loss through some form of cyber attack. Sony is understandably keen to downplay this latest hacking threat. "We are investigating the matter" is the kind of benign language more commonly used for routine technological issues, not chilling messages threatening to unleash reams of data to the world. The demands are opaque so it is unclear how damage could be wrought should Sony fail to resolve the situation before the deadline. Sony Pictures has at least reclaimed its compromised Twitter accounts. Nevertheless, this internal corporate attack does not yet appear to be of the magnitude of previous public breaches that Sony has suffered. But the fact that hackers have again apparently infiltrated Sony's systems will do nothing to restore public faith that the Japanese technology giant has its security affairs in order. And it is somewhat ironic that Sony has only just dismissed the allegation made by hackers that they had succeeded in breaching the Playstation network earlier this year. This latest attack cannot be so easily dismissed.